In this tutorial I’ll show you how to make broderie anglaise lace by hand. 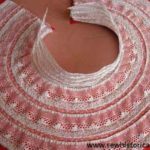 Broderie anglaise lace is a kind of cutwork or whitework lace. 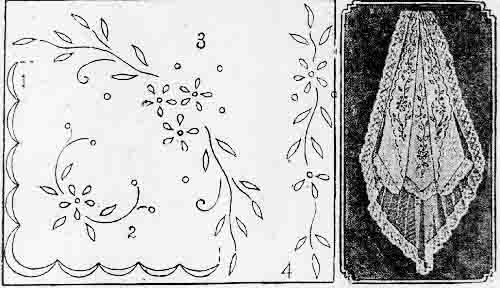 Broderie anglaise is also called eyelet lace, Madeira lace, Swiss embroidery or English embroidery. the daisy petal and locust leaf are made in the same fashion, only there are more of the latter to make and they are somewhat smaller, and, therefore, more trouble. 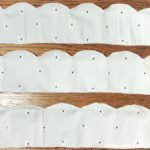 Draw the leaves all around the border of the centerpiece, leaving a piece of the linen extending beyond the irregular scallops which trim the edge of the proposed centerpiece. 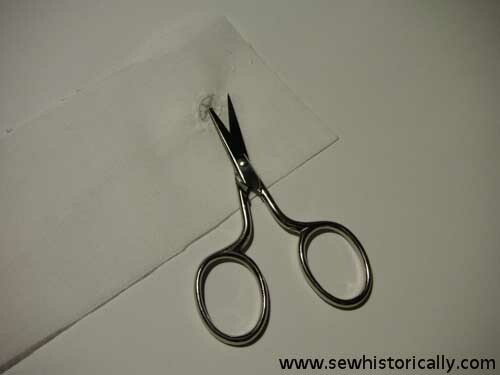 With a sharp pair of embroidery scissors cut the middle of each small leaf from stem to tip, curve the sides of the slit a little, if this will help any, and turn under the merest edge of the material, sewing it down with long sewing stiches on the right side. Darning cotton is good for this purpose. In this tutorial, I used non-shiny unmercerized cotton thread which was used in Victorian broderie anglaise: 1855 broderie anglaise lace. 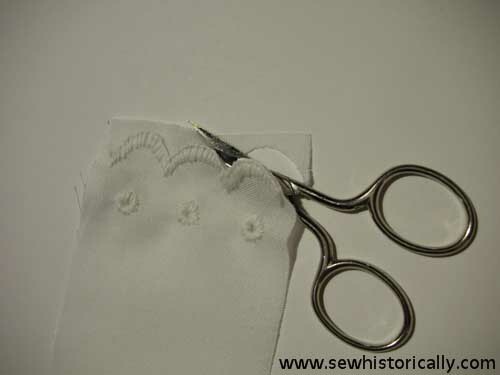 To make broderie anglaise eyelets, use an awl and pierce a hole through the fabric. If you don’t have an awl, use a big sewing needle, knitting needle or an opening spike for cans. Stitch round the hole with closely spaced overcast stitches. For broderie anglaise scallops, draw a scallop outline onto the fabric. 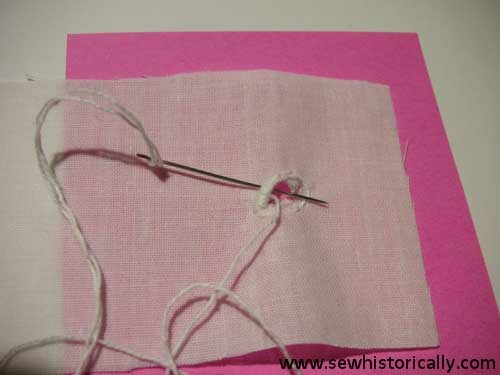 Sew along the line with closely spaced buttonhole stitches. Carefully, cut along the scallop edge. 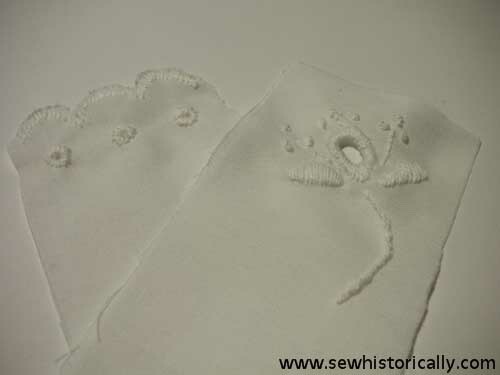 To make larger broderie anglaise eyelet holes, draw the desired outline onto the fabric. 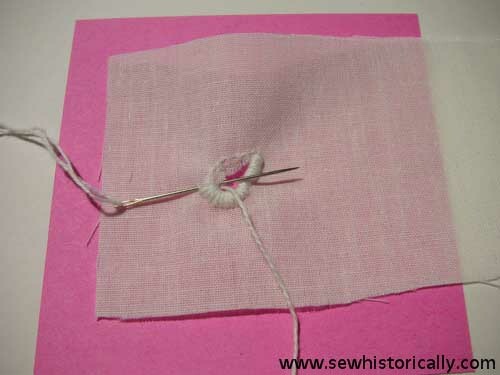 Sew with closely spaced running stitches around it. Then cut the fabric crosswise up to the drawn outline. 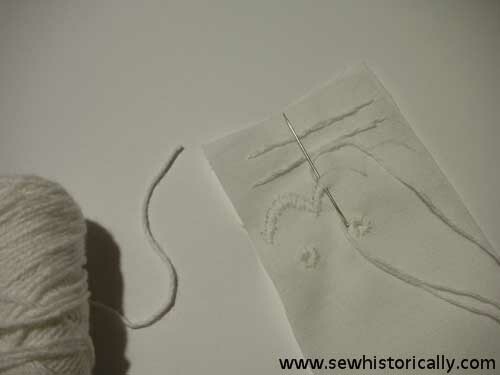 … and sew with closely spaced overcast stitches along the outline. 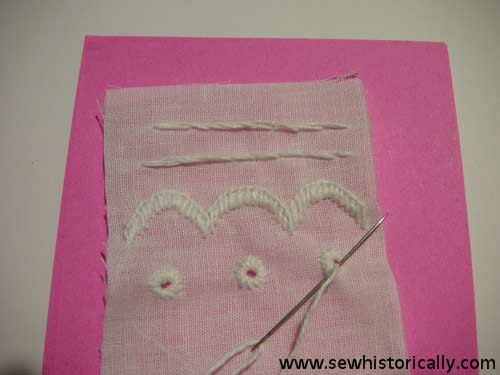 Broderie anglaise is often combined with satin stitches. 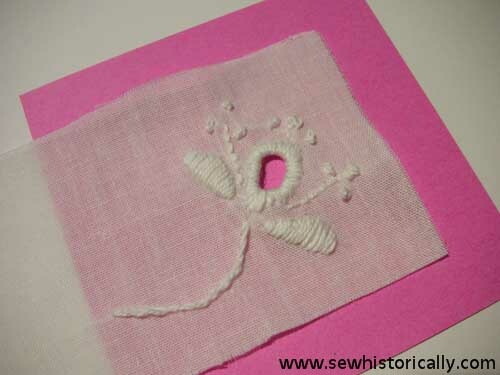 I embroidered a flower motif with satin stitches, stem stitch, back stitch and colonial knots. Lina, This is amazing. 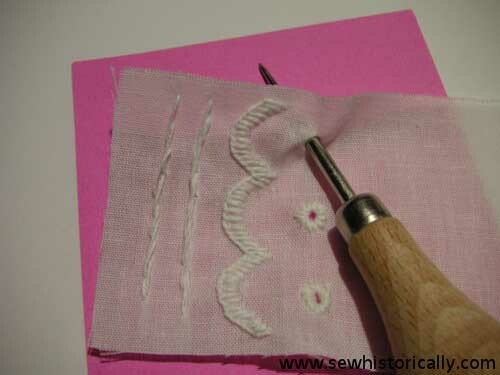 I didn’t realise broderie anglaise could be sewn by hand. I’ve featured your tutorial today. Hi I have a medium weight cotton fabric plain color, do u think this type of hand embroidery will work with it? Also let me know what embroidery thread must be used for medium weight fabrics.. I intend only to embroider the hemline .. Your work looks lovely thanks for sharing.. Thanks for stopping by, Diya! 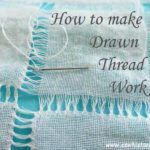 🙂 You can use everything from sheer muslin to heavy linen fabric for broderie anglaise. 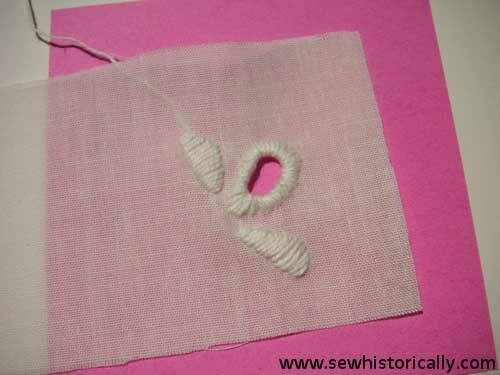 And as embroidery thread you can use ordinary sewing thread, cotton embroidery floss or yarn. Make a small sample to decide which you like best. 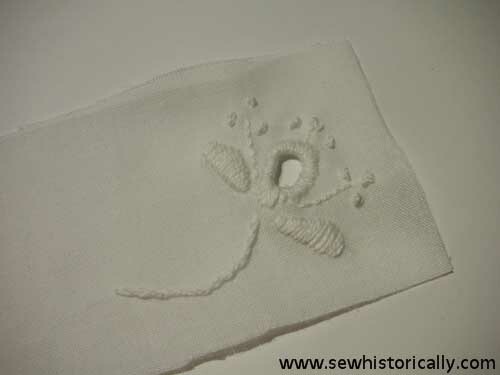 Are there any links to patterns to draw on the cotton — such as the scallop, et cetera? Hi, Paula! 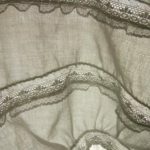 You can find some Victorian and Edwardian broderie anglaise patterns on my pinterest board “Antique Lace”. 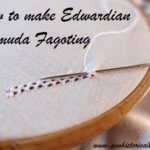 I was delighted to find your tutorial on Broderie Anglaise. My older sister (I am 72) tells me our grandma used to make using a special set of delicate tools. She was a sewing maid in service to an earl’s family and made dresses for the children. Finding you online was a link to her too. Thank you. How wonderful! 🙂 I’m glad it brought back happy memories!